Saturday my brother George came over with a bunch of eggplants. I had one in the fridge and so we had an impromptu eggplant bake. You have to be ready for big operations like this when George is around! He might show up with a bushel of squash or 10 pumpkins or something, you do not know and you do not ask. George had a craving to make Baba Ganoush such as they sell at Wegmans. Except he did not want to go to Wegmans which I understand because of the desperation there. I love Mediterranean and Middle Eastern food and I have a range of hippie recipes for Baba Ganoush so we tried two different kinds. For both kinds we diced up the eggplant into cubes of about an inch wide, and roasted them at 400 degrees. I turned the oven off for a while while we went walking in the park and then turned it back on, so all told I believe the eggplants roasted for about 40 minutes. Maybe a little too long! A few of the cubes were kind of tough. But most were just about right. The kind of eggplant dish I made also had chopped up roasted red peppers and onions in there with the eggplant. I am like Leonard Pennario, I like to improvise. 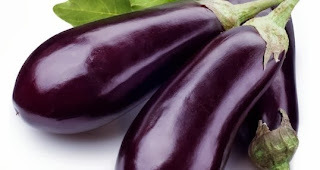 George wanted just eggplant in his Baba Ganoush. However he added mayonnaise. That was his twist. Apparently they do that at Wegmans and he had discovered it was authentic. Room full of eggplants! But we carried it off., whirling the eggplant cubes around in my Osterizer. A food processor would probably make it easier but that would mean ostracizing the Osterizer and it is my old friend so I could not do that. Here is a good Baba Ganoush to try. Next time I will probably try throwing in that yummy smoked paprika. Do not be quick to assume that supermarkets make things better than you do!